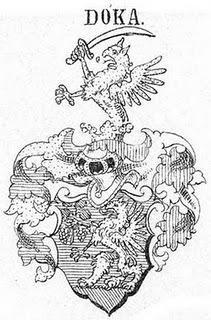 The Doka coat of arms, based on a 17th century precedent. The 1714 re-grant features a coat of arms with a mounted hussar. The Dóka family was not, as far as is known, an ancient family of Bratislava county. However, since their appearance as nobles in the 17th century, and especially since a further acknowledgment of nobility in 1714 by Emperor Charles, the Dókas have been important landowners in the county until the mid-20th century. In the 19th century, they were feudal lords of Bustelek, a village now part of Janiky in the upper Csallokoz (Rye Island), only about 15 kilometres from Bratislava. They were also, alongside the Prikkel family, the greatest landowners around Senec and Reca. Ladislaus Doka became the viscount of Poszony County in 1837. The family manor house in Reca, still extant, is now a school. A branch of this family owned the manor house and village of Almosd in Bihar County. The manor house was made part of Hungarian national myth by being the living place of Ferenc Kolcsey, a famous poet and composer of the national anthem of the 19th century revolutionary period.